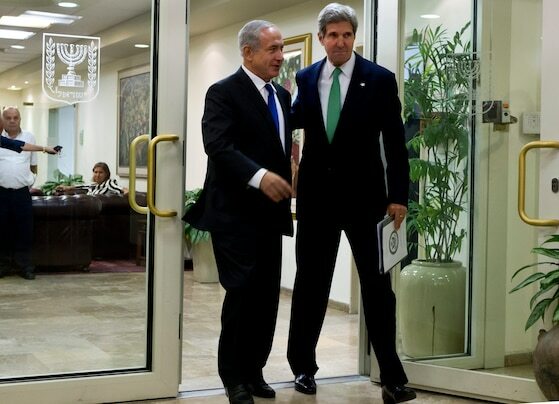 SECRETARY KERRY: I want to thank Prime Minister Netanyahu for, first of all, his extraordinary hospitality yet again. We had an extremely friendly, very productive, long discussion last night. I think it’s fair to say that we made progress, that we were pleased with the substance of the discussion and agreed, each of us, to do some homework. And we’re going to do our homework over the course of the next weeks, and today we’re going to continue some of that discussion with a view to seeing how we can really pull all of the pieces together and make some progress here. And I want to thank the Prime Minister for his good-faith efforts here. It’s been serious, it’s been focused, and I would characterize it as very productive. PRIME MINISTER NETANYAHU: Thank you. Thank you, John. It’s good to see you again in Jerusalem and to work at our common goal for peace. I am determined to not only to resume the peace process with the Palestinians but to make a serious effort to end this conflict once and for all. This has economic components. We welcome any initiatives that you and others will bring forward in this regard. But it also has a political component, political discussions that will address a myriad of issues. Foremost in our minds are questions of recognition and security. This is a real effort, and we look forward to advance in this effort with you. We’ve been talking about several other issues, and I’ll only mention two. First, we’ve been talking about Syria and the human tragedy there. But the fragmentation of that country is creating a situation where one of the most dangerous stockpiles of weapons in the world is now becoming accessible to terrorists of every shade and hue. This is of great concern for both of us, for both the United States and Israel, and we are talking about addressing this problem specifically. And last, and certainly not least, we’ve been talking about Iran. I think everybody understands that Iran has been running out the clock, has been using the talks to continue to advance its nuclear program. You’ve just heard by Iranian state television about a new production facility for nuclear material and two new extraction sites. I think we also understand what it means for the world to have rogue states with nuclear weapons. Iran cannot be allowed to cross into that world. It cannot be allowed to continue its program, its nuclear weapons program, and we must not allow it to continue to do so in defiance of the entire international community. These are the three most obvious subjects we’ve been talking about. You may not believe it, but we’ve actually talked about a few others as well. It’s good to see you again. PRIME MINISTER NETANYAHU: Thank you for everything. Thank you. SECRETARY KERRY: Thank you. Could I just add very quickly one thing? We have been talking about some economic initiative, but I think both of us – and the Prime Minister just said this – we want to make it absolutely clear that whatever steps we take with respect to economics are in no way a substitute but they are in addition to the political track. The political track is first and foremost; other things may happen to supplement it. Secondly, with respect to Iran, I have reiterated to the Prime Minister, as I did yesterday to the President, President Obama could not be more clear: Iran cannot have and will not have a nuclear weapon. And the United States of America has made clear that we stand not just with Israel but with the entire international community in making it clear that we are serious, we are open to negotiation, but it is not an open-ended, endless negotiation; it cannot be used as an excuse for other efforts to try to break out with respect to a nuclear weapon. And we are well aware and coordinating very, very closely with respect to all of our assessments regarding that. But President Obama doesn’t bluff; he’s made that very clear to me. And we hope the Iranians will come back to the table with a very serious proposal. Well, Mr. President, thank you very, very much for an extraordinarily generous and warm welcome. It’s really such an honor to be here today to share in Yom HaShoah and to be there at Yad Vashem to lay a wreath on behalf of the American people, but most importantly to simply share in the uniqueness of that expression of sorrow and honor for this remarkable moment in history that we marked. I was standing there listening to the siren wail and thinking of the stories people have told me of everybody in Israel stopping. If you’re in a car, you get out and you stand at attention. The whole country freezes. And I know it’s one of only two moments when that happens, for Yom HaShoah and for the fallen in battle in struggles. So that wailing had a profound impact on me. It was impressive. And I think the lesson of today is underscored in your comments about the possibilities for peace, the possibilities for people to live together without hatred, and finding the common ground. I believe in that, and I know you believe in that. You are correct; we have known each other, I think, more than 30 years now. And I’ve had the privilege of watching you lead as a statesman. I’ve had the privilege of working with you in the different hats you have worn in government. And it’s a great privilege for me to be able to be here now representing President Obama and the American people in this effort to try to get us across the line. We all know it’s not easy. But as you said yourself, it can be done. And it has been expressed by your leaders and others through years that people believe in the possibility of a two-state solution. I am convinced there is a road forward, and I look forward to the discussions with your leaders and yourself regarding how that road could be sort of reignited, if you will, once again setting out on that path. I would say to everybody I have no illusions about difficulties. We’ve seen them. But you have to believe in the possibilities to be able to get there, and you and I believe in them, and I am convinced that there is a road ahead. With respect to Iran and other threats, I am very pleased to confirm to you what I know you know, and what I hope the people of Israel know after the historic visit of President Obama here: You have a friend in President Obama. You have friends in this Administration, in the Congress, and in America. We understand the nature of the threat of Iran. And as the President has said many times – he doesn’t bluff; he is serious – we will stand with Israel against this threat and with the rest of the world, who have underscored that all we are looking for is Iran to live up to its international obligations. No option is off the table. No option will be taken off the table. And I confirm to you, Mr. President, that we will continue to seek a diplomatic solution. But our eyes are open, and we understand that the clock is moving. And no one will allow the diplomatic process to stand in the way of whatever choices need to be made to protect the world from yet another nuclear weapon in the wrong hands. So I look forward to our conversation, and I’ll look forward to my subsequent conversations while I’m here. And I’m confident, Mr. President, that we will be working together and seeing more of each other over the course of these next months. And thank you again for a very, very generous welcome.